The Skull: As in many ancient societies, our Clan's skull represents not death, but life - the honoring of humanity in the flesh, and the embodiment of consciousness. It alsserves an as homage to the Jolly Roger, a symbolic affirmation of unity, and steadfast dedication to challenging the natural order of things. It communicates our recognition of mortality, an acknowledgement of the fact that we cheat death each time that we navigate the LA Freeways. Towards that goal, the skull serves as a talisman, warding off evil with its apotropaic powers. Just as King Alboin celebrated victory by drinking from the skulls of his enemies (which he wore on his belt), we celebrate the superiority of British iron by wearing this skull shirt while drinking significant quantities of beer and black coffee. In that order. The Palm Tree Eyes: Glorified weeds (and havens for rats and other vermin) palm trees were imported en masse to line the streets of Los Angeles in the early 1900's and are now closely symbolic of the city. 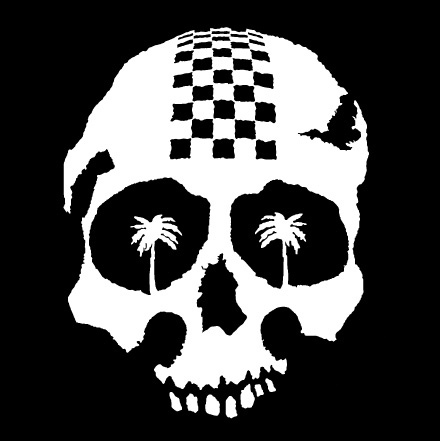 Jerry (Joe Rockhead) points out that the juxtaposition of the skull with this pervasive icon for our faux tropical, smog-ridden, traffic-jammed paradise provides powerfully contrasting symbolism, with an ironic twist. More importantly, the eyes look frazzled and cool at the same time. California: If it were a country, California would have the 7th largest economy of any nation in the world. 37 million people call California home. Of course, 36 million of them are here illegally. But the shape of California is carved into our Clan's skull because this state's 156 thousand square miles of coast, desert and mountain roads deliver some of the finest and diverse scenery and twisties on the planet. The burritos are excellent here, too. England: "If it weren't for England, there would be no British bikes." You can quote us on that one. But hey, without merry old England there'd also be no USA and by extension, no Brit Iron Rebels. We all know that the best bikes hail from the seat of the Empire. 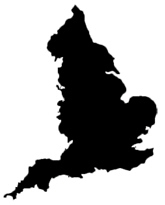 So we honor Old Blighty by carving her shape into our Clan's skull. The Racing Stripe: The checkered flag symbolizes victory, the outcome of a combination of speed, skill, luck and iron-clad huevos. Racing stripes were first used in the 50's, to identify the side of the race car in which the driver was situated. 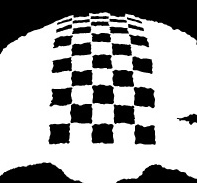 We've combined the two, by carving the checkered flag into our Clan's skull in the shape of a racing stripe. In 1906 or thereabouts, the checkered flag was first used to mark "checking stations" (now called "checkpoints") in car rallies. The position of our stripe on the white skull is a nod to the BIR Worldwide logo, which bears a checkered stripe at the apex of a white clover leaf of the same shape. Isle of Man Nose: Thanks to Limey Dave's vivid dreams of his homeland, the nose in our Clan's skull is the precise shape of the silhouette of the Isle of Man, home to the the Isle of Man TT, the Manx Grad Prix, and the BeeGees. We're willing to overlook that third one because the Isle has figured so prominently in the history of motorcycle racing for nearly 100 years, playing host to some of the most legendary races and racers of all time. Ernie Lyons - Triumph: An Irish farmer by trade, Ernie Lyons won the 1946 Senior Amateur Manx Grand Prix race on what would later be known as the Triumph Grand Prix, a hybrid Triumph rebuilt by Freddie Clarke with a Tiger 100 bottom end and a square finned alloy cylinder block and head from a RAF Triumph generator plant. The bike also featured a sprung hub - Triumph's first attempt at rear suspension. The right side of our Clan's skull features a tribute to Ernie -- his profile from a racing photo of his win at the '46 Manx Grand Prix. Geoff Duke - Norton: "The Duke" was motorcycling's firstpost-war racing "superstar," dominating motorcycling in the 1950's, winning 6 world championships and 5 Isle of man TT races. 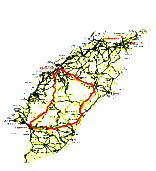 In the 1950 TT, he rode for Norton, breaking lap and race records in the TT. The Duke also invented one- piece leathers, and was the first rider ever to wear a full leather body leather suit, which he ordered from his tailor. The Duke's profile from a racing photo of his 1950 win at Blandford Camp, riding a 1950 Norton 500cc single in the first real-word racing test of the McCandless featherbed frame, is carved into the left side of our Clan's skull.